South Sulawesi Province is famous for its tradition. For travelers, Tana Toraja Regency is the best destination to explore the richness of the culture of such province. Both local and foreign tourists would love to explore it. Once you reach the location, you may feel a mystical atmosphere. It is because the villagers take care of their culture well. The best features in Tana Toraja are Tongkonan, ancient burial sites, and an uncommon way of living. Not to mention the nuance is serene and shady. Many beautiful landmarks are scattered in this region. With all these features, UNESCO has included it as one of the world’s cultural heritage. Tongkonan is the best feature in Tana Toraja Regency. It is actually a formation of traditional houses. The size varies and the shape is unique. You can only see this kind of houses in South Sulawesi Province, especially Tana Toraja. Near to these houses, you are likely to find tombstones. The locals often bury their relatives in a tree, wall, and other strange locations. It has become a culture, actually. Due to this reason, any villages in this region emit a mystical aura. Many tourist attractions are available in Tana Toraja Regency. It is because the locals often perform numerous traditional ceremonies. In fact, you can enjoy local dances. Apart from such cultural lures, Tana Toraja holds an interesting history. The locals believe their ancestors came down from the heaven using sky stairs. However, some historians didn’t approve this story. Instead, they said the ancestors of the locals were immigrants. These people came from Tongkin Cape. That means there was an acculturation back then. 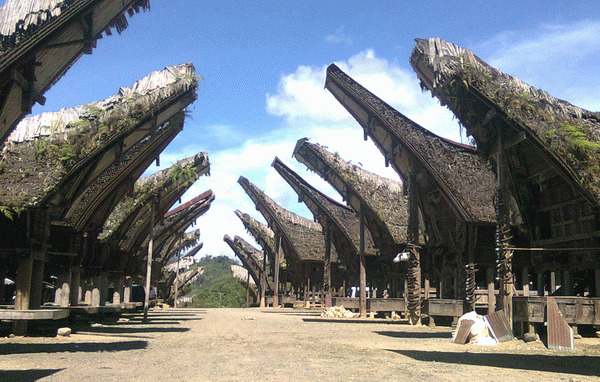 Tana Toraja Regency is the home of interesting tourist spots. Travelers can get around and visit several vacation destinations such as Londa, Lemo, and Tampang Allo. All of them share the same feature, which is the traditional cemetery. You may expect some bones on the holes of a particular wall. It sounds creepy, doesn’t it? However, visiting the local tombstones is considered a new experienced for travelers. In fact, it is the main reason why many tourists visit Tana Toraja. The best time to visit Tana Toraja Regency is in Juni or December. At these times, you are able to witness a special ceremony performed by the locals. They sacrifice tens of buffalos or pigs as the part of burial procession. The legend has it. These animals will accompany the dead person to reach the heaven. What’s next? It is as simple as exploring the villages in Tana Toraja. They have beautiful Tongkonan and culture. A trip to Tana Toraja Regency from Makassar City takes about 7 hours. The distance is 305 km. For a faster trip, you can take Poros Barru – Makassar Street. For outsiders, the first destination would be Makassar City. In fact, it is the capital of South Sulawesi Province. If you come by plane, you should head to Sultan Hasanuddin Airport. From there, take a local transportation service to Tana Toraja. That’s all.